SmartProg2 is next member of new generation of Windows 95/98/ME/NT/2000/XP based ELNEC universal programmers. Programmer is built to meet the demands of the development labs and field engineers for universal, but portable programmer. 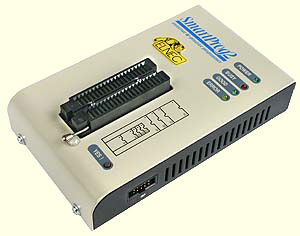 SmartProg2 is a small, fast and powerful programmer of all kinds of programmable devices. Using build-in in-circuit serial programming (ISP) connector the programmer is able to program ISP capable chips in-circuit. SmartProg isn't only programmer, but also SRAM tester. Provides very competitive price but excellent hardware design for reliable programming. Nice "value for money" in this class. Very fast programming due to high-speed FPGA driven hardware and USB 2.0 full speed port. 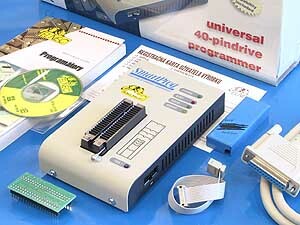 SmartProg2 interfaces with the IBM compatible PC, portable or desktop personal computers through USB port, what is important for new, LPT-port-less computers..
40 powerful TTL pindrivers provide H/L/pull-up/pull-down and read capability for each pin of socket. Advanced pindrivers incorporate high-quality high-speed circuitry to deliver signals without overshoot or ground bounce for all supported devices. Pin drivers operate down to 1.8V so you'll be ready to program the full range of today's advanced low-voltage devices. SmartProg programmer performs programming verification at the marginal level of supply voltage, which, obviously, improves programming yield, and guarantees long data retention. All known data formats are supported. Automatic file format detection and conversion during load of file. It is important to remember that a support most of the new devices requires only a software update due to the SmartProg2 hardware. With our prompt service you can have a new device added to the list of supported devices within hours! See AlgOR (Algorithm On Request) service for details. Keep Current - service means, that ELNEC send off the latest version of programmer software and updated user documentation (Keep-Current package) to customer . A Keep-Current service is your hassle-free guarantee that you are doing the highest quality programming on ELNEC programmers, at minimal cost. AlgOR - (Algorithm On Request) service gives to the user tool to influence to amount and types of programmed devices as needed. Advanced design of the SmartProg programmer and careful manufacturing and burning allows us to provide a three-year warranty on parts and labor for the programmer (limited 25 000-cycle warranty on ZIF socket). (*1) - Der Programmer kann keine Ziel-System Versorgung über den PIN VCCP vornehmen. Sollte dies notwendig sein, wählen Sie bitte den BeeProg. Note: This times strongly depend on PC speed, LPT port type and operating system free resources. Therefore values of two different PC configurations are given for comparison. 27C010 programming + verify ZIF Sockel 28 sec. AT29C040A programming + verify ZIF Sockel 32 sec. AM29F040 programming + verify ZIF Sockel 62 sec. PIC16C67 programming + verify ZIF Sockel 10 sec. PIC18F452 programming + verify ZIF Sockel 7 sec. AT89C52 programming + verify ZIF Sockel 16 sec. PIC16F876A programming + verify ISP 5 sec. PIC12C508 programming + verify ISP 3 sec. Conditions:PC Pentium 4, 2.4 GHz, 512 MB RAM, USB 2.0 HS, Windows XP. Algorithmen: only manufacturer approved or certified algorithms are used. Custom algorithms are available at additional cost. Algorithmen updates: software updates are available approx. every 2 weeks, free of charge.